If you work in a large institution such as a university, college or large school ,or if you work in a commercial environment where branding is essential, it’s important that your courses have a consistent look. 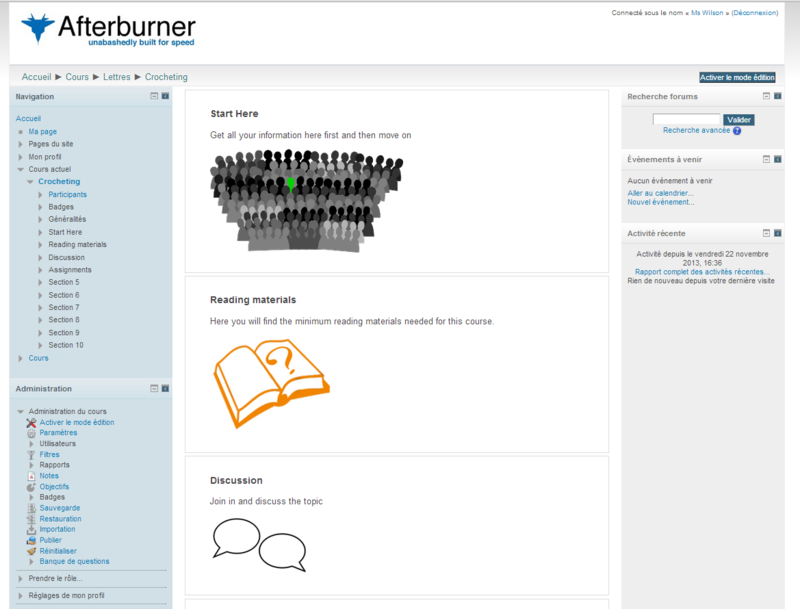 This not only improves the experience of the students (because they are not subjected to widely and wildly differing course layouts) but it’s also beneficial pedagogically: you can ensure each course contains a minimum of required resources or activities, or at the very least, commonly agreed section headings. A course template is useful here. Each time a new course is created, the template is used as a framework and extra content is built upon that. There is no “course template” setting as such in Moodle; until now Moodle admins have tended to back up and restore a previously designated course. Here’s one I made earlier. It’s called Our Moodle Template (shortname OMT) and just basically contains a number of section headings into which teachers will add their own materials. With Moodle 2.6, the process of using a course as a template has become much simpler, thanks to the new feature of being able to bulk create courses. (See Youtube video: Bulk Course creation) It’s now possible, with one single csv file upload, to create new courses from scratch and specify a course to be used as a template. The course doesn’t even need to be backed up and restored. If it lives on your Moodle already, you just need to add its shortname in your csv file under the field templatecourse. But there’s more! While the course itself will only provide the content (in my case, the section headings) you can also use the csv file to specify other settings such as role renames (facilitator instead of teacher) or language (Spanish for your Spanish language courses) or themes (maybe each of your departments or faculties has its own theme) Note that you can also use the form on the Upload courses page on Moodle to specify settings too, if the courses will all have the same settings. And, once done, here is my course – very quickly created to my personal specifications. I only made one to demonstrate the feature, but of course you can create several in one go with your file, saving lots of time! 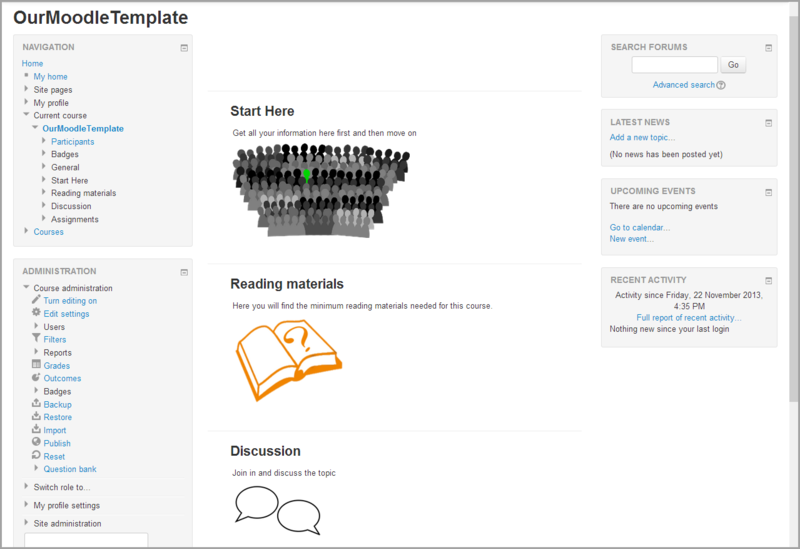 For more information on creating course templates, have a look at the Moodle documentation on Adding a new course . This entry was posted in Moodle on November 24, 2013 by admin. This was a very interesting article and will help me out with an idea I have for creating courses via templates. I get the idea but am unable to find any information on the fields that can be used in the CSV file. Please could you supply a list of all the fields that can be used in the CSV to create courses? This looks like exactly what we need at my place (http://moodle.whitireia.ac.nz). Just a question, our Student Management System integration creates the empty courses for us and manages our student enrollments, will the new Bulk Upload feature allow us to import or backup/restore content from a previous iteration if the course already exists? This is a feature that has been missing from Moodle since the beginning. We’ve used two different third party add-ons over the years. First to bulk create courses with a csv and then to do it using template courses. Finally this is a part of vanilla Moodle! Really helpful post Mary, Thank you. Thank you for this post. It’s the first source I’ve come across that clearly explains that the templatecourse parameter exists and how it works.